If you want to learn what science has to say about what the best trap workouts and exercises are for growth… Then you need to read this article. Of all the major muscle groups, the traps are one of the most important muscles for creating a powerful looking upper body and completing a well-developed frame. The original on the left and the edited version on the right with a considerable downsizing of my traps. 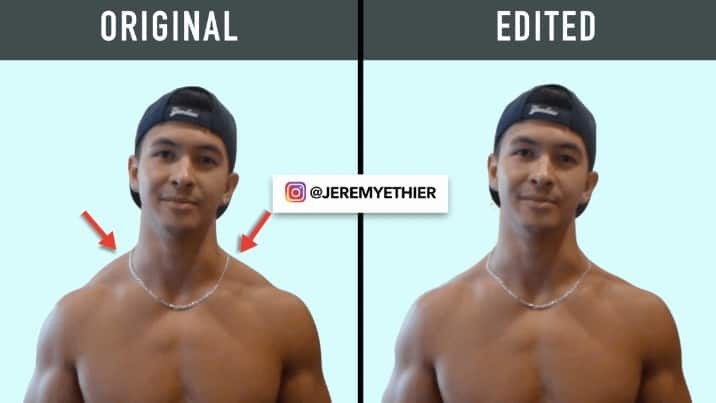 You can see the extent to which the well-developed traps on the left contribute to the overall aesthetic of my upper body by connecting the neck to the shoulders (Click Here For A Shoulder Workout). Whereas on the right, this component is absent and takes away from the muscularity of my physique. plays an important role in injury prevention and improving posture. And despite the fact that several common pulling exercises will involve the traps, they can be further emphasized through various exercises. But in order to learn how to best workout the traps, we need to first understand their anatomy. The upper traps are the region most people focus on, likely because they are clearly visible from the front view. This is detrimental since they not only help add extra definition to your back… But they also play a very important role in scapular stability which is especially useful for preventing shoulder impingement. Therefore, ensuring that you’re actually emphasizing each portion of the traps based on their function and anatomy is vital. And in this article, I’ll show you an evidence-based trap workout that does just that. When it comes to trap development, rack pulls above-the-knee have become increasingly popular as of late, and for good reason. And the reason they’re so effective at building the upper traps can be explained through the findings of the following two EMG analysis studies. 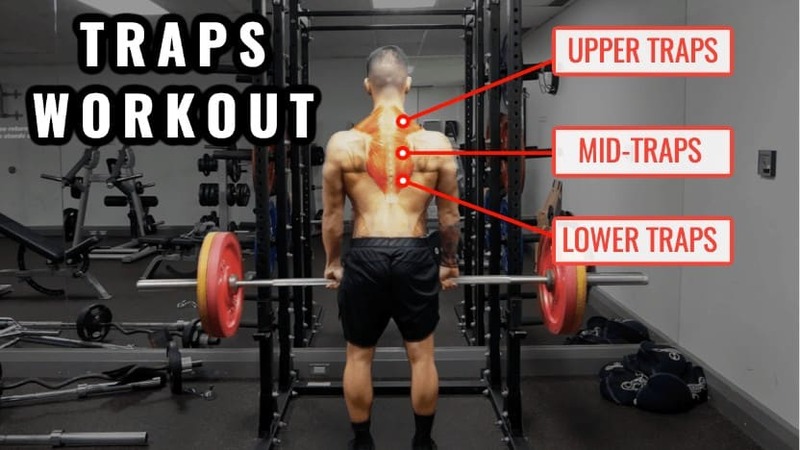 Therefore, by limiting the movement such that you’re only performing the upper portion of a deadlift, you’re able to specifically emphasize and overload the upper traps with heavy weight without taxing your lower body musculature. Simply making above-the-knee rack pulls a very effective option for targeting the upper traps without impairing your recovery. It should also be noted that since as shown in this 2011 study from the University of Kentucky, upper trap muscle activity during the deadlift increases with heavier loads, you should therefore strive to use heavy weight when performing this movement in order to maximize upper trap involvement. But as always, to avoid injury do so within your relative capabilities. They will again mainly emphasize the upper traps, and seem to be one the best options when it comes to activating and developing this muscle. In agreement with this, an extensive 2010 EMG analysis by researcher Bret Contreras analyzed upper trap activity with 25 different shoulder and trap exercises. The barbell shrug was once again found to elicit the highest upper trap activity. However, despite already eliciting high upper trap activity, it’s vital that you perform the barbell shrug optimally in order to maximize its effectiveness. This helps increase their involvement and lessens that of the levator scapulae muscle. The second thing you can do, is rather than simply shrugging the weight completely straight up and down, you want to instead think about squeezing your shoulder-blades together as you shrug up (note: I’m not talking about “rolling the shoulders”). 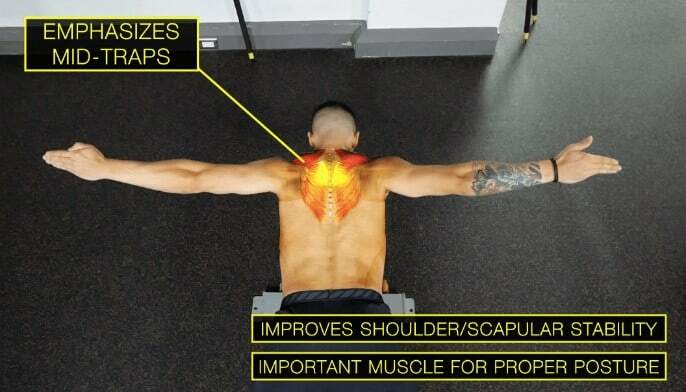 Since the upper traps not only function to elevate the scapula, but also assists in retracting it, it means that this small tweak will lead to a better contraction. This next exercise is something I’d highly suggest you add into your training arsenal. Multiple studies have found that the prone reverse fly with external rotation, such that the thumbs are pointing up, elicits maximal activity of the mid traps. This is likely because of the way the mid-trap fibers run. Now as for how to perform them, simply lay on a flat or incline bench or even on the floor and lift your arms straight out to your side with your thumbs pointing up. 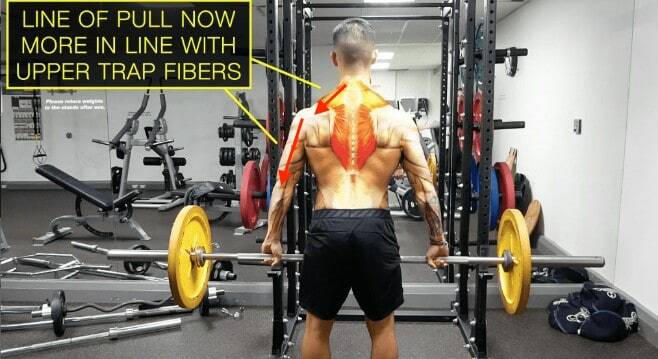 The goal is to feel a strong contraction in the middle of your back, so avoid shrugging your shoulders up as you perform them in order to minimize upper trap involvement. I’d highly suggest starting out without any weight and then gradually adding weight overtime as needed. This exercise will mainly emphasize the lower traps – which like the mid not only contribute to aesthetics, but also play a vital role in strength and stability of the shoulder and improving posture. Prone Y’s elicited the highest lower trap activation when compared to 9 other common lower trap exercises. And the way you perform this exercise is identical to the previous exercise just with your arms positioned such that they make a Y shape. I’d suggest starting out with no weight initially, and then progress it by either adding weight overtime. Another good option to overload this exercise is by applying the same concept with a cable machine for the added resistance. Where you kneel down and grab the opposite cables with each hand and raise your arms overhead such that they make a Y-shape. Keep in mind that this just a recommendation, and the optimal number of sets and reps will vary individually, but I just wanted to give you some sense of direction to take. Just note that many back exercises, especially the deadlift, already target the traps so just ensure that you’re not overdoing it. And keep in mind that you don’t just want well-developed traps, you want your back, chest, arms, and shoulders and lower body to be just as developed…. …So if you’re looking for a truly evidence-based program that shows you exactly how to do this and how to use science to help you reach your goals as efficiently as possible, then simply head on over here where you’ll be able to choose the program that best suits you.